Electrical discharge machining is a method by which we obtain the desired shape through intentional erosion created using electrical charges. This process allows us to shape even the hardest materials, including steel, aluminum, and high-temperature alloy. Regardless of how hard the material is, EDM helps us get the job done. Sinker EDM, also known as Ram EDM, involves two metal parts that are submerged in a dielectric liquid that insulates the current. The two parts coming together create electrical tension. Sparks then fly over the surface of the metal—one at a time, though at the rate of thousands of electrical discharges per second, heating the metal to its melting point and creating the desired shape. As its name implies, sinker EDM sinks the shape of the electrode onto the material. The cutting tool never actually touches the material itself. During the process, the dielectric fluid constantly washes away the eroded particles until the shape emerges. This method is commonly used in the mold and die making process. 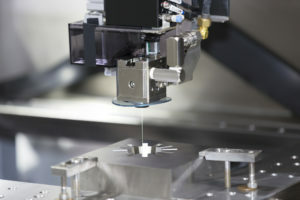 Wire EDM uses a wire as the electrode. Invented in the 1940s, sinker EDM has been around longer than wire EDM, which was first introduced in 1969. Both methods have their merits and very specific applications that they are best-suited for. 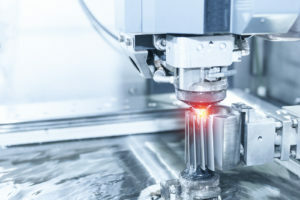 The EDM process can be used on any electrically conductive material and is especially good for materials that are difficult to machine using other methods. We use this method in the making of dies and molds and also for working surfaces that are so thin that no other machining system can achieve the desired result. State of the art EDM machinery is a must-have for any application with a need for precision accuracy. Working with an experienced shop that is equipped with newer machines can give you access to accuracies in the range of 0.000005 inches – a level of tolerance that is a must for industries such as aerospace, aviation, diagnostic, and medical devices. However, it does not always give you the best value to use wire EDM or sinker EDM exclusively; sometimes, it might be more practical to have some parts machined in this way and others by more conventional means. We offer a complete range of machining services under one roof, giving you access to the best possible options for your machining project. Our team will work closely with you during every phase, considering all of your needs and wants before recommending a plan of action. Ultimately, we are all focused on one thing: delivering top-notch results for all of your precision parts needs. Working closely with our engineers, we can assure you of the most efficient and economical process from start to finish. Our shop has the capability to handle small or large-scale production according to your needs. Whether it’s simple or complex, we bring our trademark enthusiasm and professionalism to the table every time, giving you the benefit of our experience, our passion, and our insight to make your concept shine. If you have a project that requires precision machining in Houston, Westpoint Tool and Molding should be your first call. We are a small, independent organization that thrives on bringing ideas to life. We truly love what we do – and it shows. Get started: Give us a call today. We’d love to hear about your project and talk to you about how we can make it real.